House, 30 square meters . Mercure Lyon Centre Château Perrache price per day from € 75 Next to Lyon Perrache TGV Train Station and a 10-minute walk from Place Bellecour is this 4-star hotel. Period furniture feature in the rooms at Mercure Lyon Centre Château Perrache. Guests can admire the original decoration over Mercure Lyon Centre Château Perrache’s buffet breakfast or traditional dishes..
Best Western Hotel De Verdun price per day from € 72 Hotel De Verdun is located in central Lyon on the Presqu’Ile, 450 metres from the Lyon Perrache TGV Train Station. There is also a bar where guests can relax with a pre-dinner drink or read the free newspapers. Hôtel du Simplon price per day from € 55 Hôtel du Simplon offers en suite accommodation in Lyon’s Presqu'île district between the Rhone and Saône Rivers. Hôtel du Simplon rooms are equipped with air conditioning, a satellite TV and a private bathroom with a bath or shower. Simplon Hotel’s staff is available to recommend nearby restaurants..
Hotel Du Dauphiné price per day from € 48 The Dauphiné is located in central Lyon, 200 metres from Perrache Metro. It offers low-cost private parking and en suite rooms with soundproofing, cable TV and free Wi-Fi. The Hotel Du Dauphiné has a front desk and luggage storage, open from 6:00 to 1:00 The Hotel Du Dauphiné is situated 20 metres from Place Carnot where guests can find numerous bars and restaurants..
Campanile Lyon Centre - Gare Perrache - Confluence price per day from € 42 Lyon Centre - Gare Perrache is located in the centre of Lyon, 100 metres from the Lyon-Perrache Railway and Metro Stations. 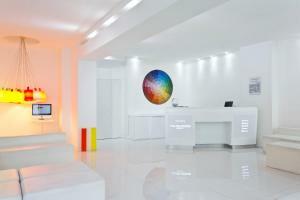 It offers rooms with a flat-screen TV and free Wi-Fi. Guests are invited to relax in the hotel’s lounge with a free newspaper. Hotel des Savoies price per day from € 39 Hotel des Savoies provides en suite rooms with satellite TV in the Presqu’ile district of Lyon. 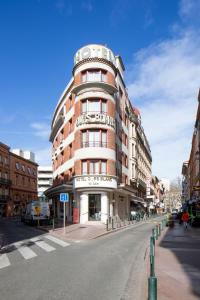 It is conveniently located just 600 metres from the Perrache Railway and Metro Stations (line A)..
Berlioz Nn Lyon price per day from € 61 The Hotel Berlioz is located in Lyon, a 15-minute walk from Place Bellecour and Lyon's Old Town. Its rooms are air-conditioned and have private bathrooms, a flat-screen TV and free WiFi. 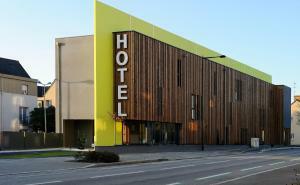 The reception is open 24/7 and a covered car park is located just 100 metres from the Berlioz Nn Lyon..